Today’s Feature Friday spotlights one of our retail partners in Florida: Don Alan’s. Located in downtown Pensacola, Don Alan’s celebrated its 30th year in business last year. The shop carries a wide range of menswear – from casual wear to custom clothing – for men of all ages. Pensacola is located in the Florida Panhandle. Founded by Spanish explorer Tristán de Luna in 1559, Pensacola is considered “America’s First Settlement.” Pensacola is also known as “The City of Five Flags” because it has been ruled by five governments in its history: Spain, France, Great Britain, the United States of America, and the Confederate States of America. A few years ago, we decided to enter the trousers business. After some research, we discovered that the premier factory for Made in USA pants was Hertling Trousers. Morris Hertling opened the factory in Brooklyn, New York in 1925. His son, Julius (known as “Julie” by his friends), took over in 1946 after returning from WWII where he served in the US Army. We were sad to learn that Julie passed away this week. Julie was truly a titan in the industry. 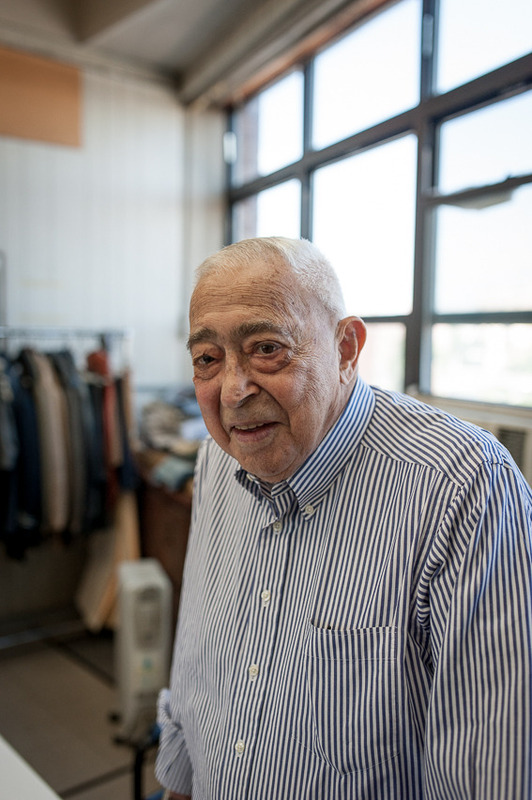 His dedication to the US garment trade was second to none, and his commitment to excellence made Hertling Trousers synonymous with high-quality, yet affordable, Made in USA pants. If you’ve purchased a pair of American-made trousers, there’s a good chance that they came from Hertling. We were fortunate to have known and spent time with Julie. While some in his position may have turned away a company trying its hand in the trousers business, Julie welcomed us with open arms. He was genuinely happy to work with another Made in USA company. Julie invited us to his factory for a tour, took us out to Brooklyn’s famous Peter Luger’s (where Julie had his Tuesday lunch for over 50 years), and graciously shared his vast knowledge of the trousers business. Put This On is one of our favorite menswear blogs. The blog is a helpful resource for men’s style, featuring thoughtful posts about “dressing like a grownup” and updates on where to find the best deals for quality menswear. Last year, our friends at Put This On started a weekly series called Style & Fashion Drawings. The series – which you can catch up on here – features illustrations from Ryan Cecil Smith and Graeme McNee. We’re excited to share that this week’s illustration (pictured above) was about Dapper Classics socks! We hope you enjoy the illustration as much as we do. Today’s Feature Friday spotlights one of our retail partners in Mississippi: Circle Seven Outpost and Provisions. Fueled by his love of the outdoors, William Pace opened Circle Seven in Madison in 2007. Circle Seven is a men’s and women’s clothing store, specializing in hunting and sportswear. Circle Seven opened a second location, Circle Seven @ Garden & Gun, in Charleston earlier this year. Madison is a small city in central Mississippi. “The City”, as it is commonly called, was named after President James Madison. Madison is the hometown of Stephen Gostkowski, 2x Super Bowl Champion kicker for the New England Patriots.